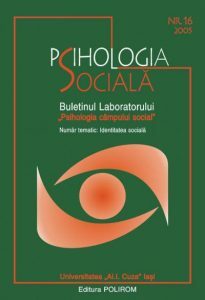 The Journal of Social Psychology provides an interdisciplinary forum for exploring various areas of Social Psychology . Its main objective is to provide specialists and students the most recent developments in this field of science. (Adrian Neculau). Peer review: All published articles in this journal have undergone rigorous peer review, based on initial editor screening and anonymous refereeing by independent expert referees. The members of the scientific council, responsable for the peer review process, are professors in the following universities: Aix-en-Provence, Geneve, Valencia, La Sapienza (Rome), Paris-V (Sorbonne), Paris-X (Nanterre), Liege, Bucharest, Iasi. Each paper is evaluated by two reviewers, within a double-blind procedure. Revista de Psihologie Sociala © 2019. All Rights Reserved.